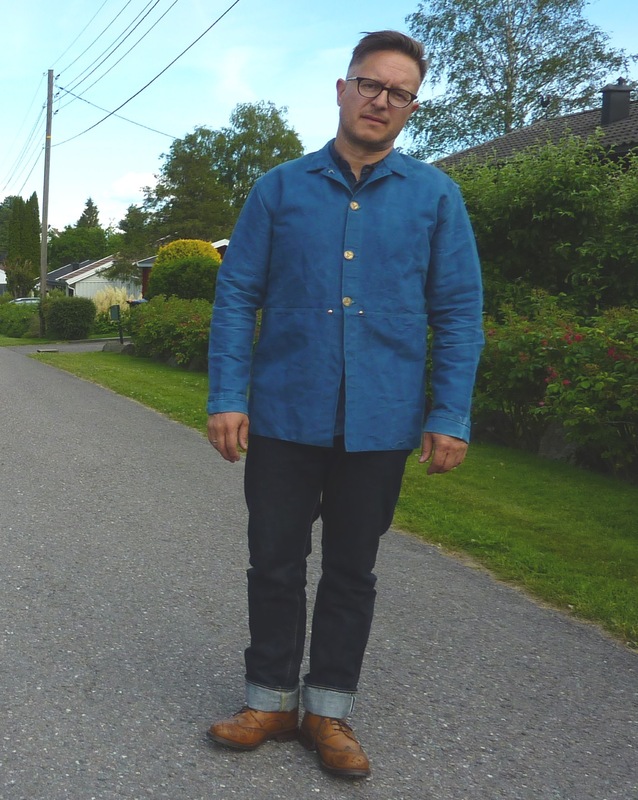 Blue collar cool: Tender 980 darted shoulder jacket - Well Dressed Dad - It is a proper menswear blog. Like, with original words and opinions and suchlike. To continue the series I started last week, today’s entry for blue collar jackets is the Tender Type 980 Darted Shoulder Jacket. This is my most recent addition in this category, but it’s already seen a decent amount of use, and my appreciation of it is growing. Tender is very much the essence of the Made in England cottage industry. Owned by William, almost all the garments are made by a couple in their little factory, and when items need dying it is William that does the actual dipping, together with a chap that is a true specialist in odd dyes. So in a world of faceless articles, a jacket from Tender is something where all the processes and people involved have been documented, from cutting to sewing, to dyeing. Even the specially cast brass buttons have been documented. Quite remarkable. 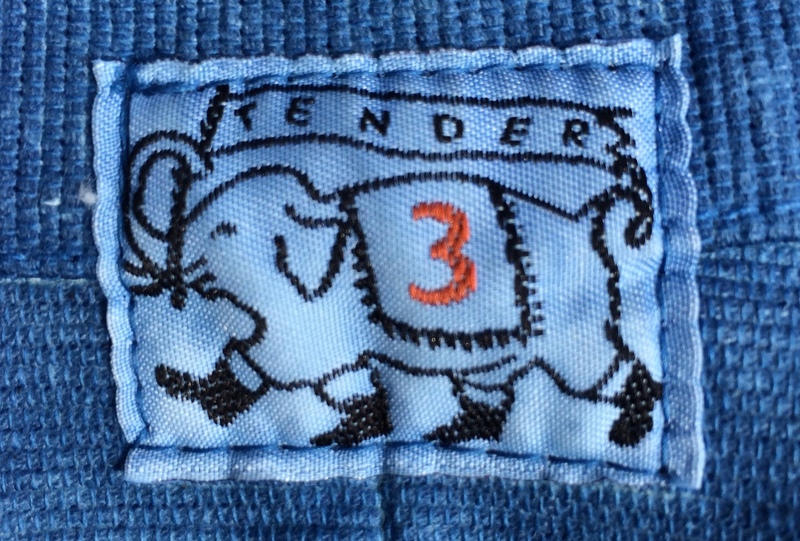 In Tender sizing, I’m a size three. This translates to a medium in conventional sizing. The design of the jacket is also quite different. Based on a design from the British railway industry the front and back pieces are cut from a single piece of fabric, with darts created at the shoulder for the dual purpose of creating the shape and also to create a pad-like structure. The jacket is available in several quite different fabrics and colours, as 17oz Japanese selvage unbleached cotton denim, or rinsed English cotton molleton, dyed with woad, logwood, turmeric or just natural. My jacket is in a specially woven 18oz cotton ottoman fabric, dyed with woad, a dye in the same family as the more common indigo. Cotton ottoman, you ask? It is a fabric with a pronounced ribbed or corded effect, often used for legal dress or formal dress. Don’t worry, I’d never heard of it either. It’s nice though, with structure and a certain initial stiffness. And the woad dye gives it a very pleasing blue hue. 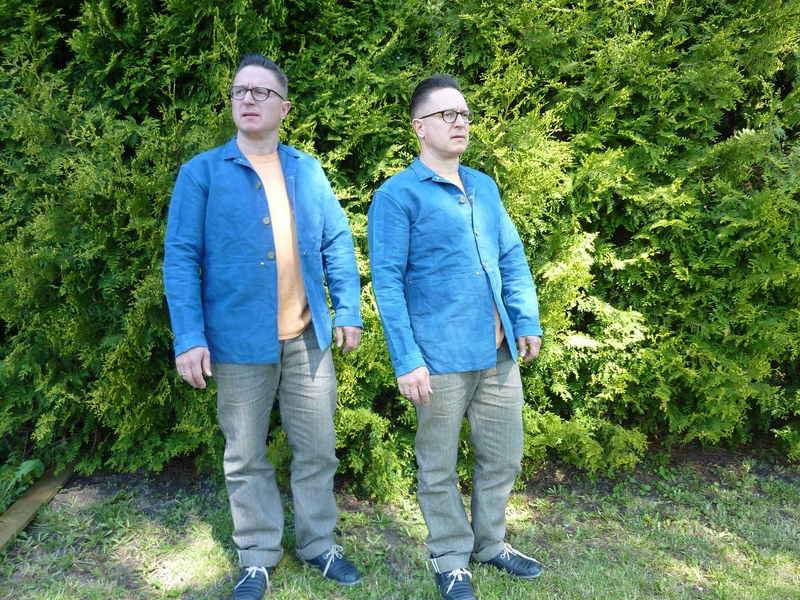 Tender jacket and jeans, both woad dyed. The large full panel front pockets are also cut from the same piece of fabric as the front and back, but turned up, showing the reverse, with copper dome rivets to strengthen at the top. With this jacket you can brag freely about having deep pockets indeed, in fact so deep that I found it quite difficult to get my phone out of them initially. Now I appreciate that nothing will ever fall out, even though I’m pedalling hard! Fit-wise the jacket is intended to be quite anti-fit and going by body size alone might lead to confusion, as while the body is roomy the arms are quite slim. Mine is a little tight over my shoulders and upper arms, but it is loosening up through wear. The oddest thing about it though… The buttons, and … Well, is there one or two missing? I’m growing used to it, but I have been on the verge of asking William for a button or two extra. Then I arrest myself and consider that this is a big part of the different that has been added to this jacket. Adding a button or two would make it that much more like other jackets, so why not keep it as it’s maker intended? The jacket is “garment dyed”, which means that it was dyed blue after being sewn together. All in all, I like this jacket a lot. It fits well into my collection as a piece sufficiently different from the others and I adore all the dedication that has gone into making it. There is no doubt about it being a fairly expensive jacket, but making it the way Tender does, could it really be that much cheaper? Also wearing a carrot-dyed Tender t-shirt here!